We recently explained how we source our sushi, and so this week on the blog we thought we’d teach you the best way to eat it. In order to fully appreciate the niceties of Japanese cuisine, it’s often a good idea to learn how to use chopsticks, regardless of whether you’ve opted for home delivery sushi or are visiting a sushi bar. Surprisingly, many people never fully mastered their use, preferring instead to use their hands or cutlery. But as you’ll see, chopsticks are relatively easy to handle once you know how. Here’s a guide on how to properly use them together with some tips on Japanese culinary etiquette as well as a sprinkling of oriental history. The trusty chopstick originated in ancient China with the Shang Dynasty before it use spread to other countries such as Korea, Vietnam and Japan. Their design has remained relatively unchanged ever since and usually consists of two, equally size sticks which are often smooth and tapered. Most of the kinds you’ll find in a restaurant or sushi bar are made from materials like bamboo, wood, plastic or stainless steel. 1. Pick up one chopstick with middle finger and thumb – once you’ve secured a chopstick between the middle-finger and thumb, make a firm grip to ensure that it doesn’t move in your hand. A fool-proof way of doing this is to place the broad end of the chopstick in the palm of your hand, while your thumb and pointer-finger clasp the narrow end. 2. Grip the second chopstick with your index finger and thumb – put your thumb over the second chopstick so that it’s above the first. Ensure that the narrow tips of the chopsticks are even so that you’ll be able to effectively pick up food without crossing them. Tapping them on the table often helps to achieve this. 3. Experiment with your favoured grip – aim to get the top chopstick moving while the bottom stick should remains still. Also adjust your grip for comfort. What works for some, might not work for others so experiment until your grip feels right. 4. Try to open and close the chopsticks – now it’s time to try out your carefully crafted grip by opening and closing the chopsticks. If you’re having trouble, try to adjust your grip or start again from Step 1. 5. Pick up the food – once you’ve got your grip sorted and you can open and close the sticks without too much trouble, try picking food up. If you feel like you’re about to inadvertently launch your food across the restaurant put the chopsticks down and start again. Once you’ve mastered the use of chopsticks, you’ll need to know about etiquette. As you’ll see, there are a few gastronomic no-no’s that you should be aware of before unleashing your new chop-stick handling skills. Transferring food to somebody else’s chopsticks – the “go on try-some” brigade will be rather disappointed with this one. The Japanese always offer their plate for transferring food or pass it along the table if the distance is far. In addition, transferring from chopstick to chopstick is how bones are passed between mourners during Japanese funeral rites. So needless to say, this practice is best avoided. Spearing your food – there’s a television advert currently doing the rounds depicting a young lady triumphantly holding aloft a piece of sushi she has just speared after some ponderous attempts at using her chopsticks. Never do this! Most chefs consider the act of spearing their food as a direct insult to their ability. This is particularly true with regards to sushi, which is painstakingly prepared. Place the pointed ends on a chopstick rest – when a chopstick rest is not provided, as is often the case with sushi takeaway establishments, a makeshift version can be made by folding the paper case that contained the chopsticks. Don’t just place them on the table. Crossing the chopsticks – don’t cross the chopsticks. This symbolises death and is practiced during funerals. Chopstick placement – chopsticks should be positioned in a right to left direction with the tips on the left. Diagonal or vertical positions are considered bad form. Food from other plates – as mentioned, transferring food using chopsticks is frowned upon. However, you can take food from a shared plate with the use of the thick end of your chopsticks, provided you’ve already used them. Hopefully the above suggestions will help you become rather adept at using chopsticks. Be sure to remember some of the rules of etiquette as well. This will enable you to get the most out of your dining experience and ensure that national customs are respectfully observed. 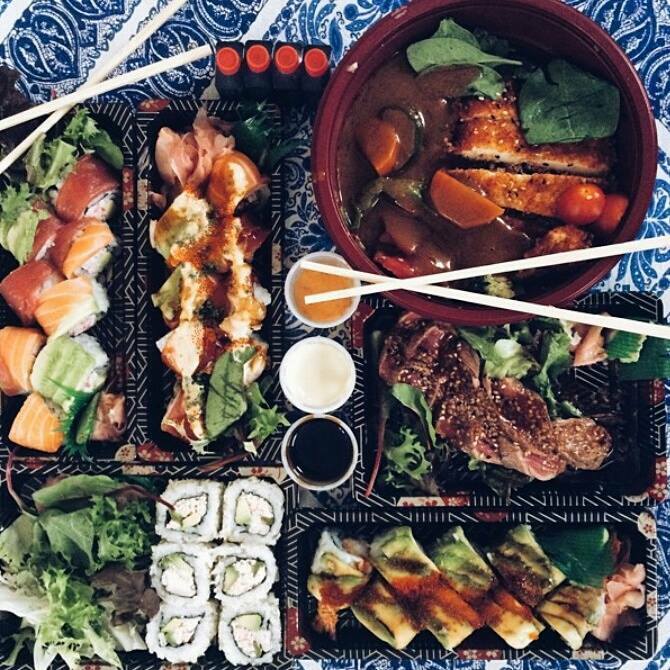 For more information about sushi delivery in London, visit our main website.